Here we will try to explain in simple terms what are CD-Rs and how they are made and used. CD-Recordable (or CD-R) stands for Compact Disc Recordable. It is a technology through which a blank compact disc, a CD-R, is converted into an audio CD or a conventional CD-ROM. The finished "burned" CD is capable of being read in any CD drive of a computer, or a stand alone CD player (for audio). This is done by means of a recording system that uses write once (WORM) optical discs standardized by Philips and Sony, and a CD recording device that is connected to a host system. The recording process is controlled by software incorporated into the subsystem. All CD-Rs are governed by the "Orange Book, Part II" standard and must conform to a specific set of standards regardless of the manufacturer. What is the "Orange Book"? The "Orange Book" is a document that describes the specifications for CD-Write Once (CD-R) technology developed by Philips and Sony. It defines both the physical structure and physical dimensions of a CD-R disc as well as the use of certain portions of the recording surface to calibrate the recorder laser power, to record lead-in and lead-out data and to record the program actual data. There are several parts to the "Orange Book, Part II" reference to CD-R.
What does "Orange Book" certified media mean, and why? The "Orange Book, Part II" is the primary specification for CD-R media. Accordingly, all CD-R media must meet the "Orange Book" criteria for recordability and playback. Philips and Sony, the originators of the "Orange Book", provide "Orange Book" certification of CD-R media. The principal purpose of multiple sessions is to allow additional data to be appended to a previously recorded disc. (Note that some older CD readers can read only the first session of a multisession disc.) A session is defined as a data section including lead-in, program data and lead-out. A CD-R recorder that supports multisession can write a disc that will have multiple sessions linked together so that any multisession supported CD reader can access the data, whether it was written in the first session or any other subsequent session. The "Orange Book" limits the number of sessions per disc to 99. In contrast, the data structure of a regular CD-ROM contains just one lead-in area and one lead-out area. What is the recording speed of CD-R? The "speed" measurement of a CD recorder is how fast it can record data to blank CD-R media. Speed designators such as "2x", "4x", "8x", "12x"and "16x"are multiples of the original playback speeds of first generation CD-ROM players. For a CD-ROM player or CD recorder, a "1x" speed translates to 153,600 bytes per second. This is usually rounded down to 150 kb per second. Therefore, a "1x" recorder writes 150 kb per second to the CD-R media. Likewise, a "2x" recorder writes at 300 kb per second, a "4x" records at 600 kb per second, a "8x" records at 1200 kb per second, a "12x" records at 1800 kb per second and a "16x" records at 2400 kb per second. Note that there are some variations in measuring speed because there are recording modes that provide more than 2048 data bytes per frame (audio is recorded at 2352 bytes per frame). Also note that some CD recorders have a different reading speed than their rated recording speed. For instance, the TrueCopy 24S/16S recorder can write at "24x" speed and read back at "40x" speed (usually used to verify what was written). What is the difference between CD-R "fixation" and "finalization"? "Fixation" is the process of writing the lead-in and lead-out information to the disc. This process finishes a writing session and creates a table of contents. "Fixation" is required for a CD-ROM or CD-Audio player to play the disc. Discs which are "fixated for append" can have additional sessions recorded, with their own session lead-in and lead-out, creating a multisession disc. On the other hand, when a disc is "finalized" the absolute lead-in and lead-out for the entire disc is written, along with information which tells the reader not to look for subsequent sessions. This final table of contents (TOC) conforms to the ISO 9660 standard, or the recent UDF protocol. Disc-at-Once is a writing mode that requires lead-in, program data and lead-out to be written in one (1) write event. Another name for this is "Single Session" recording. All of the necessary information you wish to record needs to be staged on your computer hard disk prior to recording in the Disc-at-Once mode. This mode is usually necessary for discs that are sent to a CD replication facility for CD-ROM replication where the CD-R is the original source. By recording in the Disc-at-Once mode, you eliminate the linking, run-in and run-out blocks associated with multisession and packet recording modes which often are interpreted as "uncorrectable" (E32) errors during the glass mastering process. Track-at-Once is a writing mode that allows a session to be written in a number of discrete write events. The disc may be removed from the writer and read in another writer (given proper software) before the session is fixated. The sessions written contain complete "tracks" of information. Be aware that your writer and software application for writing CD-Rs must specify they are capable of writing in Track-at-Once mode, or any other mode for that matter. What is incremental or "packet" writing? Track-at-Once writing is a form of incremental write which mandates a minimum track length of 300 blocks and a maximum of 99 tracks per disc. A Track-at-Once written track has 150 blocks of overhead for run-in, run-out, pre-gap and linking. However, "packet" writing is a method whereby several write events are allowed within a track, thus reducing overhead. These "packets" are bounded by 7 blocks for run-in (4), run-out (2) and link (1). What's the difference between a "multisession" disc and a "multitrack" disc? A "session" is a unity on a CD which is bounded by lead-in and lead-out. A session contains one or several tracks (up to 99 per disc). There are two types of tracks. A "Red Book" (also developed by Sony and Philips) audio track is usually written in Disc-at-Once mode along with several other tracks in one session. These tracks have index numbers in the sub channel which differentiate one from another. The other type of track is the incrementally written type described above. What is the production process for CD-R? CD-R manufacturing is similar to pressed CD injection molding with a few differences. The glass master used to make the stamper for the injection molding machine contains a wobbled pre-groove defined in the "Orange Book". The molded substrates are spin coated with a proprietary dye that each manufacturer has developed. On top of this, a gold or silver reflective coat is added by means of vacuum deposition and this is followed by a spin coat of lacquer protection. Additionally, some CD-R manufacturers then add extra layers such as scratch protection to increase durability as well as a printable surface for use in inkjet printers. Is there really any difference between blank discs from different manufacturers? Obviously, there are going to be some differences simply because the discs have been manufactured in different factories using different equipment. However, all discs conform to the recording specifications of the "Orange Book, Part II". In that regard, all blank discs should work in your recorder. But unfortunately, they do not. You should check with your recorder manufacturer for specific recommendations. Why are different manufacturers' discs different in dye color? The dye color of the CD-R disc is related to the color of the specific dye that was used in their recording layer of the disc. This base dye color is modified when the reflective coating is added. Some of the dye and reflective coating combinations appear green, some appear blue, while others appear gold. Visual differences between various media types are irrelevant from the standpoint of their actual operation -- it's the dye that matters. Why does it matter what dye is used to make the CD-Recordable? 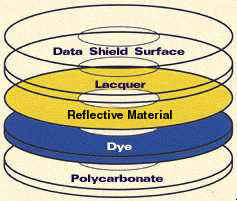 The dye formulation used in a CD-R is perhaps the most critical factor in the disc's performance. All manufacturers use one of these dye's "Phthalocyanine" dye, "Cyanine" or "Azo". What are the differences between cyanine, phthalocyanine and azo dyes? There are a number of important recording characteristics associated with each dye and reflectivity coating combination as well as some longevity issues. Each media manufacturer strives to balance the engineering characteristics of the dye to insure greater compatibility with recorders and readers and long archive life. In addition to cyanine and phthalocyanine, there is also azo dye. Cyanine dye and its metal-stabilized derivatives were originally used because the "Orange Book, Part II" referred to the recording characteristics of cyanine-based dyes in establishing CD-Recordable standards. Consequently, dyes based on cyanine tend to have a wide range of acceptable recording power levels and recording speeds. The "Phthalocyanine" dye is a much more stable dye tolerating exposure to light, heat and humidity. Thus, after recording longevity and reliability have been improved. Azo dye has been used in other optical recording media and is now being used in CD-R. These different dyes in combination with dye thickness, reflectivity thickness, materials, and groove structure is what enhances or compromises the media's recording speed, recording power and media longevity. What is the difference between 74 and 80 minute media, they look the same to me? If I have small data sets, is there any reason that I should use 74 minute media instead of 80 minute media? 74 minute and 80 minute CD-R media are recorded at different speeds giving you the ability to record more data on the 80 minute media. Very early generation CD recorders specified the use of 74 minute media as their standard, but current generation recorders can handle either. In the past you may have been able to save a small amount of money by using 74 minute media. However, since current manufacturing processes preclude any differences between the costs of 74 minute and 80 minute media, most CD-R media suppliers offer 80 minute media at the same price as 74 minute media. Consequently, 74 minute media will eventually be eliminated. Why do some CD-R suppliers indicate the capacity as 680 mb while others designate their media as 650 mb? There are really only two capacities on CD-R: 74 minute and 80 minute. These "time" capacities can be translated to bytes of data by multiplying the CD delivery rate of 75 frames per second and 60 seconds per minute. Each frame is 2048 bytes, so a 74 minute CD-R disc contains 333,000 frames and 681,984,000 bytes. This translates to 650 mb (remember to divide by 1024 to convert bytes to kb and divide again by 1024 to convert kb to mb). Likewise, the 80 minute CD-R holds 360,000 frames or 737,280,000 bytes which is approximately 720 mb . Sometimes you will also see a disc capacity rated as 780 mb. This refers to how much digital audio (PCM) data can be carried on the disc. Audio discs require less error correction data and so each frame has 2352 bytes of data giving a 74 minute disc 783,216,000 bytes of digital audio (PCM) data or 746 mb capacity. I've heard that 74-minute discs are more reliable than 80-minute discs. Is this true, and if so, why? Today's CD-R media, whether 74 minute or 80 minute capacity are equally reliable. Several years ago, the 74 minute may have appeared more reliable because some recorders were tuned to that media capacity. The 74 minute media records less data into the same real estate than 80 minute media. The recorded features are larger and this obviously results in better "system margins" and robustness for the CD reader. However, the reliability of 80 minute media has been improved to the point where this is no longer a concern. The 80 minute standard is firmly established and all the recording devices can reliably record to it. How can you tell if some media is better than other media? Several service bureaus and some of the CD quality analyzer manufacturers can run your recorded disc through their equipment and provide you with qualitative error reports that will help you compare media. Note, however, that you also need to account for differences in recording conditions, handling, recording software, the recorder and its firmware version etc. as well as the batch and type of media you use. Also note that there can be substantial variability in the test results obtained from commercial testing equipment, so your media testing should be done on the same piece of CD test equipment and the measured results will be relative not absolute. Is it necessary to verify discs after recording? Periodic verification of your recordings helps you maintain an appropriate quality level. If you never verify the data, then sooner or later you will have a problem. An absolute zero defect disc is not possible. All discs have errors. The normal reading process corrects these errors by means of hardware decoders that have error recovery algorithms in them as well as the additional third level of error correction contained in a CD-ROM/CD-R data stream that corrects faulty data through software. You should verify the data and learn how to use a CD quality analysis tool to determine that the quality of the recording is within the specification limits for errors. I can read the CD-R disc on my CD-R drive, but when I put it into a CD-ROM drive it won't play. What should I check? The most common reason for this is that the disc has not been "finalized" by the recording software making it unreadable by the CD-ROM reader. The finalization process is the last part of the multisession recording process which writes the overall disc table of contents into the disc lead-in area which makes the disc conform to the ISO 9660 standard, or UDF protocol, required by most reader and reader driver software. My CD replicator tells me that their analyzers show that my CD-R master discs have errors, but before I send the plant any disc, I play them on a variety of CD players. I have never noticed a problem before, so how can I check if there are any errors before I send out my master disc? There are desktop CD analyzers as well as software that will read your disc to determine the extent of Block Error Rates (BLER) and Burst Error Rates (BUR) on your disc. All of these hardware and software solutions will tell you if E32 errors exist on the disc. Hardware solutions will also tell you the error counts for less serious errors (El-E22). Errors that are "uncorrectable" by the CD-ROM reader CIRC circuits. However, these errors are usually correctable by the third level of error correction contained within the data stream. The correction process is usually referred to as interpolation which literally is a "guessing game" performed by the playback device to fill in the "missing" ones and zeros. Obviously, the less E32 errors the better. One plant rejected my CD-R master disc because their analyzer reported errors. I then sent the same disc to another plant, and they accepted it. Do different plants have different analyzers that give different results? Yes, the CD factories do have different analyzers. An analyzer is only as good as the CD reader inside it and this assumes that it is calibrated to the Philips B5 Reference Disc. More than likely, the plant that accepted your disc pulled off the data and re-premastered it to another CD-R or Exabyte tape for mastering. They also charged you for the service. Will discs written at "4x", "6x", etc be readable on "1x" and "2x" drives? Yes. The recording speed is independent of the playback speed. Is "4x" thru "12x" recording covered by the "Orange Book, Part II" specification? Revision 2.0 of the "Orange Book" only covers "1x" and "2x" recording speeds. However, The "Orange Book Study Group" in Japan (OSJ) is currently revising the "Orange Book" to cover higher speed recording. I've heard that burning a CD-R at higher speeds is better than single speed recording. Is this true, and if so, why? There is some truth to this. The physics, chemistry and thermodynamics of the recording process seem to produce more consistent and readable marks within the CD-R recording layer when recording is "2x" or higher. This may be due to the annealing process of pit formation at "1x" where the heat caused by the laser remains focused on the pit for too long. Newer recorders and media are tuned better for the HIGHEST recording speed specified by the manufacturer. If I record a disc at "2x" on a "8x" recorder will it make a better copy? The CD recorder manufacturers that provide "8x" recording capability also make recommendations regarding the type of PC you need to successfully record CD-R media, as well as the type of CD-R media that you should use in their CD recorder. If you follow these recommendations, the speed that you record ("2x" thru "8x") produces an identical CD. If your PC system can not support the data throughput required to drive the CD recorder at its rated speed, then recording at "2x" speed is the only way that you can proceed to make your CD. What does "4x" certified mean? The first CD recorder manufacturer to produce a "4x" speed recorder was Yamaha and they actively encouraged the CD-R media manufacturers to produce media capable of recording at the "4x" recording speed. CD-R media capable of recording at "4x" speed were designated "4x certified". Today, most of the media can be, and should be, recorded at the HIGHEST speed as improvements to the media are considered industry standards. Do discs really need to be "high speed certified" to work in a quad-speed recorder? Simply put, if a certain media states that it is "8x certified" then you should use it in a 8x speed recorder. Remember, special attention has been made to insure compatibility between that particular media and a particular recorder. Unmatched media-recorder combinations may bring unexpected results. Are CD-Rs reliable and read compatible? Yes, and yes. The common specification agreed to by all CD-R media manufacturers and CD recorder manufacturers is the "Orange Book, Part II" which defines a specification to insure interoperability. However, not all media have the same degree of reliability. Some manufacturers, like Mitsui, Kodak include a special safeguard coating, others don't. For critical applications it is best to choose a CD-R that has a protective layer. What is the un-recorded shelf life of CD-R media, or how long can I store a CD-R disc before I record on it? The shelf life of CD-R media is about 5 years. However, it has not been verified by independent testing to obtain an accurate measurement of the shelf life. How long will one-off CDs last, or how long will data recorded on a CD-R disc remain readable? Lifetime estimations of any kind of storage media is a very complex and statistical based process. Improper testing or measurement procedures can seriously impact and compromise lifetime estimates (mostly to the advantage of the manufacturer). As a result, the ANSI Committee ll9-5 is currently developing comprehensive guidelines for determining the longevity of CD-ROM and CD-R media. Although CD-R manufacturers have performed their own "in-house" longevity studies, suffice it to say that today's media is suitable for critical and archive-able situations. I've heard of something called "CD rot" that "eats" compact discs. Is any data really safe on CD, and for how long? The "Great CD Rot Scare" of 1990 caused a lot of grief. But more importantly, it focused on two issues in the pressed CD manufacturing process. A CD is read by having laser light in the reader reflect back from the reflective layer in the CD. The reflectivity of laser light is important for pressed CDs as well as CD-R media. If the lacquer did not fully cover the edges of the CD then oxidation would attack the reflectivity layer causing some data reading problems. Secondly, some labeling Inks used in the silk-screening process were chemically active even after UV curing. This interfered with the reflective layer, again, causing read back problems. The good news is that both issues have been solved for pressed CDs several years ago, and the CD manufacturers made changes to their manufacturing process and material selection. Likewise. CD-R manufacturers have benefited from this experience. Note that conventional CDs use aluminum as their metal reflective layer, and because aluminum is reasonably reactive, it can corrode when exposed. Most CD-Rs, on the other hand, use noble metal reflectors, like gold and this eliminates the risk of corrosion and oxidation. Result. Data is safer on CD-R media. How can I clean my CD-R media? Use a lens tissue (obtainable from camera shops) and wipe the disc in a radial direction. Can you tell if a disc has been written to just by looking at it? For a partially written disc, the answer is yes. For a full disc, you can compare it to an unwritten disc to see that the reflectivity has changed and that the disc has been written. Is there a certain way to handle the media? Yes. The CD-R media should always be handled by the edges or the center hole. You can also handle the disc by grasping it inside of the center hub stacking ring. CD-Rs should always be stored in jewel cases or CD caddies to prevent scratches rather than being left in a stack. My CD-R media has fingerprints and dust on it. Do I need to clean it off? Normally, the read laser will focus beyond the disc surface so that fingerprints and minor scratches do no affect the data integrity. A dusty disc should be blown off so that the dust does not enter the drive mechanism or wind up on the reader mirror or lens. If you must wipe the surface, do so with a lens tissue and wipe gently in a radial direction. Are there service companies that can restore data from a scratched or otherwise damaged disc? The same companies that provide CD quality analysis usually have access to a wide variety of CD readers as well as high quality readers used for disc analysis. These companies perform disc reading on a service basis and could help you with data recovery. Is there any way I can repair my own CDs that have been scratched or damaged? Generally, no. Although it is technically possible to "fill" surface scratches with an optical adhesive and UV light curing, it is not practical. Transferring your data to a new CD-R is far less expensive. What are the options for CD-R printing? CD-Rs can be labeled in several ways, depending on what level of professional look you desire and what you can afford. Permanent ink felt tip markers that use water soluble ink are the least expensive method. This is followed by using paste on labels. Then there are printer manufacturers who have designed devices specifically for printing CD-Rs. For instance, Rimage makes a thermal wax transfer printer where the print quality has a silk-screen look. Inkjet printer manufacturers, such as R-Quest, have a more low-cost solution for printing full-color labels as suggested by their Signature III thermal inkjet printer. However, an inkjet printer requires a special "printable" surface on the CD-R, and have either a white or clear printing surface. Additionally, CD-Rs can be silk-screened in a fashion similar to pressed CD-ROMs (this is cost-effective only if you have 1000s of CD-Rs to mass produce). What kind of pen can I use to write on my printable CD-Rs? Using a felt tip pen (such as a "Sharpie") is the easiest and fastest way to label a CD-R. Note, however, a few caution items. Some chemical properties of the ink can actually permeate the disc surface and cause damage to either the reflective layer or dye layer below the surface. Never use a ball point pen or any other sharp object to label your discs. The absolute safest area to label your CD-R is within the center stacking ring that surrounds the center hub hole. Some manufacturers, like Dixon Ticonderoga, use a water based ink that is permanent. Never use a permanent marker pen that contains a solvent. Can I safely put a stick-on label onto my CD-R? Stick on labels can work as a labeling option for CD-R, however, there are some caveats that you should first consider. If you misalign the label or you don't smooth the label down (inducing air bubbles under the surface), then you run the risk of having your CD-R spinning out of balance. This could cause read back and tracking problems. If you try to reposition the label after it is partially stuck, then you run the risk of damaging the CD-R as you remove the partially stuck label. The long term consideration is that you are placing a label onto a spinning disc in a heated environment. Will the adhesive hold for the long haul? In all fairness, there are some labeling companies that have created label positioning devices and have tested their label adhesion properties during spin and heat cycles and they claim to have solved the above issues. The good news is that paste on labels are one of the least expensive professional-looking labeling methods, albeit some adhesives can "outgas" over time and the solvents can adversely impact the optical system playback. With the advent of high speed playback devices (40x speed and up CD-ROM players), another "spinning out of balance" situation has cropped up. Some users have reported read back and tracking problems when placing a CD-R with an adhesive label into a "40x" or higher CD-ROM drive. Apparently, the label is causing enough weight to alter the balance of the spinning drive. Replacing the CD-R with an "unlabeled" CD-R corrected the problem. How can I silk-screen on my discs? What kind of ink should I use? There are service bureaus that will silk screen your discs and the CD-R media distributors can provide this service as well. Also, you can buy equipment for silk-screening the CD-Rs yourself. You need to use a UV curable ink if you are going to silk-screen so that the color inks will not run together. You also need to be sure that the UV curable inks do not contain any chemically active components that can affect the disc after the curing process. Likewise make sure there are no abrasive particles used in the ink pigments that can damage the protective layer of the CD-R disc. Should I print or silk-screen on discs before recording on them or after recording on them? You may not have a choice in this matter. For instance, your media manufacturer may wish to do the silk-screening and want to do that step while the media is still at the factory. Likewise, most service bureaus will not silk screen on recorded media because they don't want to accept liability for damaging any recorded data. For inkjet printing, either way works. If you print on blank discs and then record, you are assured that the recording process has been successful and that no further handling during printing can disrupt readability. Also, if you print first and make a mistake, the recovery time does not include another recording session. Most CD recorders operate under active write power control or Optimal Power Control (OPC). The spec concludes that if you label first, then any subtle reflectivity effects can be recognized and compensated for by the OPC. Simply preparing your system for writing to CD-R. It should not be confused with the term "mastering". What's a better platform for burning my own CDs -- a Mac or a PC? Either platform is suitable. In defining "better", you need to examine where your data is coming from and if you are adding any indexing, linking or authoring to the data before creating your CD-R. Likewise, you need to also consider the specific CD recorder that you have or are planning to buy. Or what platforms you intend to be compatible with. A number of recorder software products are specifically enabled for a specific platform and may not cover all platforms. Do I really need to worry about formats and standards if I'm burning my own discs? Why can't writing a CD be as easy as writing to a hard disk? Why do I need a formatter to record a CD-R when my hard disk or MO drive only needs a software driver? The technology of CD-R recording is evolving. A formatter gives you a great deal of control over your entire disc structure. Newer software, on the other hand, acts like a driver by allowing you to assign a drive letter on your PC to the CD recorder. Information is then copied to that drive. A formatter is required whenever you are writing the disc in "Disc-at-Once" mode rather than the newer multisession "packet" recording modes. On Macs it's a bit easier. The built-in SCSI controller in conjunction with the premastering software automatically identifies the writer. Placing a blank CD-R in the drive brings the writer to the desktop. In any instance, optimizing your drive or partition before you begin writing is advised. By using a utility application, such as Norton's Utilities, optimizing defragments the volume assuring a smooth transfer from the drive to the CD-R.
What is a buffer underrun and why is it a problem with CD-R? When you record to CD, one of the technical things that happens behind the scenes is that pieces of the data are interleaved between frames. This data interleaving is done to make the media more robust and protect the data from large surface scratches. When the CD recorder begins to write a data stream it can not stop at some arbitrary point before the interleaving is completed. If your computer system can not feed data to the recorder fast enough, you, in effect, drain the buffer memory of the recorder. This "buffer underrun" condition cuts off data from the recorder and interrupts the writing process. The resulting disc will be unplayable in most CD-ROM players. Why does multisession have so much overhead? Multisession requires about 13.5 mb or 6750 frames between sessions. The lead-out area at the end of the session acts as a "landing zone" for the read laser. The lead-in area at the beginning of the session allows for the complete Table of Contents (TOC) to be written for the most recently recorded session. The word "hybrid" has several different meanings as it applies to CD. One use of hybrid is a CD that contains two separate file systems: ISO 9660 and Macintosh HFS. The disc can be inserted into either an IBM-type PC or an Apple Macintosh or any other computer system that supports the ISO 9660 file structure. Another use of hybrid is a disc that is designed to interact with the Internet. This implies a hybrid publishing model where part of the information resides on CD and another part resides within the Internet. Still another use of the word hybrid refers to the "Orange Book" definition of a disc that contains pre-recorded information on it and allows the user to record information as well. How do I make a "customized" hybrid disc that shows only PC information for PC users and Mac information for Mac users? Several software providers have software systems that allow you to do this. As you shop for premastering or CD-R formatting software, just ask the vendor if they can provide support for a PC-Mac hybrid CD and obtain their instructions on how to proceed. I want to use the same data resources for 3 operating systems on one disc. How does that work? This is a true hybrid disc which probably combines ISO 9660, Level 1, Rockridge Extensions (for Unix) and Macintosh HFS. Premastering software for this combination is available from several software vendors. Can I make a hybrid (Mac and PC) disc on my PC? Most, if not all, of the hybrid software commercially available, is Macintosh-based for the simple reason that Apple has made tremendous efforts to allow importing and conversion of PC data into the Macintosh environment. Also, the Macintosh disk formatting software recognizes both native Mac/HFS as well as PC formats. Does the location where files are placed on a disc have any effect on playback performance? Yes, but to a very minor degree. The fastest retrieval is for those data placed on the inside tracks (near the start of the CD). This is because it takes longer to seek data from the outer (or end) of the CD and the lag time for the disc to rotate faster in those outer regions. Therefore, if your CD is written in "Disc-at-Once" mode and you have some control over critical indexing information, that information should be copied to the CD before other data files. Also, for a multimedia type disc, the location of files can be extremely important so that files that are likely to be accessed together are physically close to one another on the disc. Why can't I use long filenames on my discs if my operating system can use them? Short filenames of the 8.3 variety are part of the ISO 9660 file structure. If you require longer filenames, you should use the "Joliet" extensions to ISO 9660. What's a "mixed mode" disc? A mixed mode disc combines data and audio tracks on the same disc. Data recording and audio recordings require different "modes" so that the reader can interpret the information correctly. So, a mixed mode disc allows you to record a data track followed by one or more audio tracks. Contrast this to the new CD Plus or Enhanced CD standard that lets you do the same thing, only in the reverse order (ie, the audio tracks come first). Can I record audio onto CD-R? Yes, you can. In fact, it was the heavy use by audio studios to create "check" discs or "reference discs" for recording artists that started the CD-R industry. Currently, an estimated 25-30% of current CD-R discs are used for audio applications. The first CD-R writers recorded audio only, and had to be modified to handle the data or CD-ROM format. Great progress has been made by hardware and software manufacturers to allow you to capture audio and then record it to CD-R.
Can I record directly from DAT to CD-R? The DAT formats for audio and data are different on tape than on CD-R. You need to first convert the format using a disk-based PC system, make the appropriate PQ edits and then write the information to CD-R using a "mastering" software package. How expensive are audio CD recorders? CD recorder prices have fallen dramatically over the past years and they are expected to continue dropping in price. When first introduced in 1989, a CD recorder cost over $60,000. The latest generations of CD recorders, as SCSI devices, are well under $1000. However, stand-alone units such as the Marantz 615 or 620 are much more expensive. But considering the fact that these units (which do not need computers) include high quality analog to digital convertors as well as editing capabilities, the overall costs may be less than a computer-based system. Can CD-R discs be used as "masters" for stamping? Yes, they can. If you are planning to do this, then you should discuss the use of CD-R as input transfer media with the mastering facility you have selected. The mastering facility will require you to verify that there are no "uncorrectable" or E32 errors on the CD-R that you provide. This is because the software used in the glass mastering process to drive the laser beam recorder is often set up to terminate the glass mastering process if an E32 error is encountered. Do discs have to be created in "Disc-at-Once" mode to be used in a mastering facility? The mastering facilities have traditionally preferred "Disc-at-Once" mode because their mastering software did not know how to correctly interpret other recording modes used by newer generations of CD recorders. Now, however, several of the mastering facilities have upgraded their mastering software to interpret multisession recording modes. This opens the door for you to record in "Track-at-Once" or "multisession" mode. However, you need to verify that your selected mastering facility can handle the specific mode that you would like to use. What "mastering" software should I use? Software specifically designed to prepare and transfer your files from your hard drive to your CD recorder, and eventually (and permanently) to your blank CD-R. Some all-purpose software is adequate enough if you are burning CD-Rs for your own library. However, if your intentions are more professional you may need more powerful software. For instance, a CD replicator (such as Sony's DADC) needs a "glass master" to faithfully reproduce professional retail-ready CDs. These "glass masters" are created from your desktop CD-R with the proper software. Toast CD-DA from Adaptec is one such program. Then there's the ultimate "mastering" software from Sonic Solutions. Nevertheless, items to be concerned with for proper "mastering" include crossfades, level matching, EQs, compression and limiting, and PQ coding (as well as other codes set forth in the Solomon-Reed spec). Is cost the only reason to choose CD-R? At less than US$0.01 per megabyte, CD-R has substantial cost advantages over alternative storage devices. However, CD-R presents other advantages to the end user which are equally compelling. For instance, CD-R is not a proprietary technology. Since CD-R is governed by the "Orange Book" standard, users can choose from a large selection of compatible media, writers, and software from many different vendors. Presently, there is an installed base of over 90 million CD drives in the current market. The penetration of CD drives in new computers now approaches 100%. No competing media remotely approaches the level of popularity of the compact disc. And since CD-R media is fast, low maintenance, reliable and non-proprietary, CD-R users are assured that their data is accessible to everyone. And unlike tape drives, the media does not move across a head causing friction between the writing mechanism and the tape. CD-R most definitely represents the state-of-the-art in low cost, high performance, archival optical media. CD-R discs are able to serve as a long term data repository as well as a convenient means of exchanging data due to their longevity and universality. Once recorded, data on a CD-R cannot be altered or erased. CD-R will permit additional recording upon a partially recorded disc but no existing data may be changed or deleted. Furthermore, studies indicate that discs manufactured with Phthalocyanine dye will last well over 100 years with some accelerated aging tests showing longevity of over 200 years. Discs using conventional Cyanine dyes will last for approximately 20 years. How are CD-R discs different from CD-ROM or CD-Audio discs? CD-R discs are quite different from conventional CD-ROM/Audio discs. CD-ROM/Audio discs are mass produced using specialized equipment and are projected to last for about 20 years. CD-R discs can be written at your desktop using an inexpensive CD recorder and, in the case of Phthalocyanine dye media, are projected to last well over 100 years. As in a conventional CD-ROM or CD-Audio disc, polycarbonate is used as the foundation. A dye (Phthalocyanine) which is etched by a laser to create the pits and lands. (The integrity of the recorded data relies on this critical component.) A layer of lacquer is then applied, followed by Data Shield Surface which provides additional protection against environmental hazards and rough handling. What is your recommended minimum configuration for CD recording? A 386 computer with a SCSI controller that supports 600 kb per second sustained transfer rate, the so-called "AV" compatible hard disk drive (non-thermal recalibrating, 7200 rpm), 4 mb RAM will perform adequately to record CDs at "2x". For "burning CDs at "8x" a Pentium system, PCI controller card, "AV" compatible hard disk drive (2 gb or higher), and 24 mb RAM is required. The hard disk and system bus should consistently deliver 600 kb per seconds to avoid buffer underrun. For Macintosh users, a Centris or Quadra with 16 mb RAM and 1 gb ("AV") hard disk with 600 kb/sec transfer rate operating under system 7.1 or later (including MacOS 8.x) is a minimal requirement for "2x" recording. A PowerPC is required for Macintosh operation of a recorder at "4x" speed or higher. What is the best and cheapest CD-R system? "Best" and "cheapest" may be contradictory requirements. The newer CD recorders are much lower in prices than in the past. And through improved testing and better integration, can produce quality CDs within defined specifications. Where can I find drivers for any CD-ROM drive? The manufacturers of CD-ROM readers can supply you with software drivers. Some can be downloaded from the manufacturer's site. In addition, if your CD reader is either SCSI or ATA interface based, there are several software companies that provide generic software drivers for these industry standard interfaces. How is data recorder to a CD-R? The blank CD-R is placed in a CD writer or recorder which uses a laser to write to the disc. The laser creates a series of holes in the disc's dye layer called "pits". The spaces between the pits are called "lands". The pattern of pits and lands on the disc encodes the information and allows it ti be retrieved on an audio or computer based CD player. How long does it take to burn a CD-R? It depends upon how much information you are writing. To completely fill a 74min/650mb disc using a "1x" writer takes 74 minutes. If you use a "2x" writer, the same job would take about 37 minutes. A "4x" writer would do the job in about 18 minutes, "8x" about 9. What is the best CD player to use with CD-R? The CD-R media manufacturers and the CD recorder manufacturers have done a lot of testing to insure that all CD media, recorder and player combinations are in agreement with CD specifications. Essentially, any CD player that conforms to the CD spec is the best.